Our new Provincial office is based in the heart of Belfast City Centre. striking a balance between modernity and ancient traditions and customs. 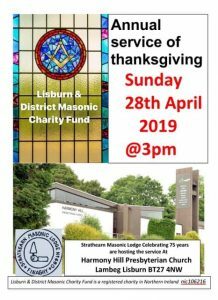 Masonic lodges in Antrim contribute thousands of pounds to Masonic and Non-Masonic Charities. 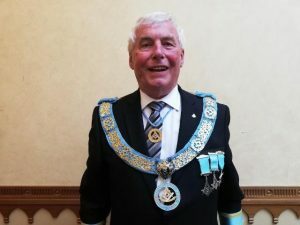 As the Provincial Grand Master, I welcome you to the official website of the Provincial Grand Lodge of Antrim. The main purpose of this website is to give both Masons and Non-Masons an insight into our organisation. The Province of Antrim has 150 Lodges and forms part of the Grand Lodge of Ireland. It stretches from the Greater Belfast area to Portrush and Ballycastle in the north. Freemasonry requires its members to treat each other, with respect regardless of class, creed, colour or race. It is non-sectarian, non-political and reminds us of the needs of others who are less fortunate than ourselves. Hence, one of our main aims, is to support, not only Masonic Charities, but many other local charities, such as, the N.I. Hospice, Action Cancer, N.I. Air Ambulance, TLC (Teddies for Loving Care) and many others. Many people assume that to become a Freemason you have to be invited to join. This is not the case and whilst members may encourage their friends to become freemasons, there are other ways in which you can join. We often use the saying, “to be one, ask one”. If you are interested in receiving more information on becoming a freemason, go to the “Joining Section” of our website and complete the information requested and someone will contact you. I hope you enjoy your visit to this site and look forward to welcoming you in the future. Freemasonry is a beautiful system of morality, veiled in allegory and illustrated by symbols. Freemasonry means different things to each of those who join. For some, it’s about making new friends and acquaintances. For others it’s about being able to help charity. To be one, ask one. If you are interested in joining, just contact us Freemasonry Northern Ireland through this website and someone will get back to you. There are certain criteria that must be met. Ask! Charity is one of the most important Masonic principles. Masonic institutions world wide contribute to both Masonic and non-Masonic Charities. Find out more. Interested in joiningthe Masonic Order?